Sunday, Ed came by to drop off a new set of bees. 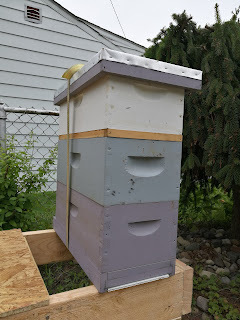 We're going to keep them in the 5-frame nuc boxes instead of moving them into a full size hive. Hopefully, they can grow in numbers so that they can keep themselves warm thru the winter. They seem healthy and busy. The bottom nuc box is full with brood and nectar. 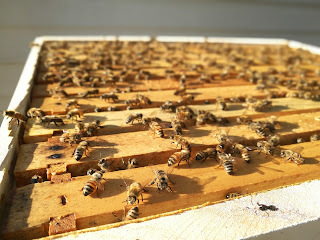 The second box was just introduced a couple weeks ago and there is one frame with comb. The next time we check on them, there should be more progress. The new Queen is a lot lighter than the last one, who was black. These are the same types of bees, Carniolan. Yesterday, I got a phone call from Matt asking if I had seen his text message. I'm driving and #adulting so I don't text and drive anymore. The bees have swarmed. 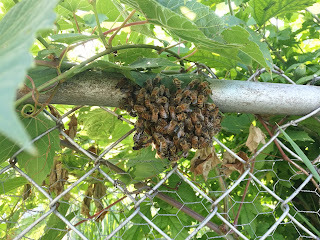 Luckily, they attached themselves to our back fence, easily accessible. In about an hour, they had all gone in. Still, their small numbers will not be enough to last them through the winter. I've just had a... feeling about the hive. 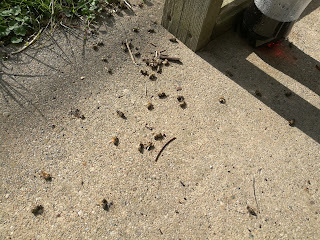 Since the install, we've seen bees walking around outside of the hive, on the ground, near the entrance. They're walking and moving slowly, almost as if they brought themselves out of the hive because they knew they were dying. So there's dead bees by the entrance. I know that they remove the dead ones, but something just seemed odd about the number of bees by the entrance. We've also noticed that bees are dying with their tongues sticking out. I didn't really think anything of it. Matt looked it up and read that it's a sign of pesticide poisoning. I asked this in a beekeeping FB group and it was confirmed. Suggested if I could learn where and when people were spraying, I could at least lock up the bees until it settles. It's been a week and 5 days since we've installed the Moana hive. We cracked her open last Saturday, just to take a peek at any progress. Saw lots of brood, covered caps, larvae, and eggs. No sight of the Queen, even though she's dotted with a yellow dot.